Starting Tuesday, Jan. 29, new time restrictions will take effect for the City of Sarasota’s parking garages and on-street parking places, City Manager Tom Barwin has reminded the public. Parking will remain complimentary in the Palm Avenue and State Street garages for the first two hours only, instead of the three hours the city has provided, Barwin noted in his Jan. 18 newsletter. The rate structure will remain the same, he added, with the first hour costing $3. A person will be charged $1 for each subsequent hour or part thereof. On-street parking time restrictions will remain the same — two hours, Barwin added. Enforcement will be extended by two hours in the evening, Barwin continued, and it will be added on Saturday. 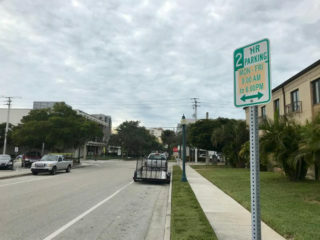 Therefore, the new enforcement schedule will be Monday through Saturday, 9 a.m. to 8 p.m.
“Hundreds of on-street parking signs will be changed very soon to reflect the enforcement hours,” Barwin pointed out. “Busy, vibrant cities manage mobility and parking challenges in a variety of ways, including this new and necessary public parking paradigm,” Barwin wrote.